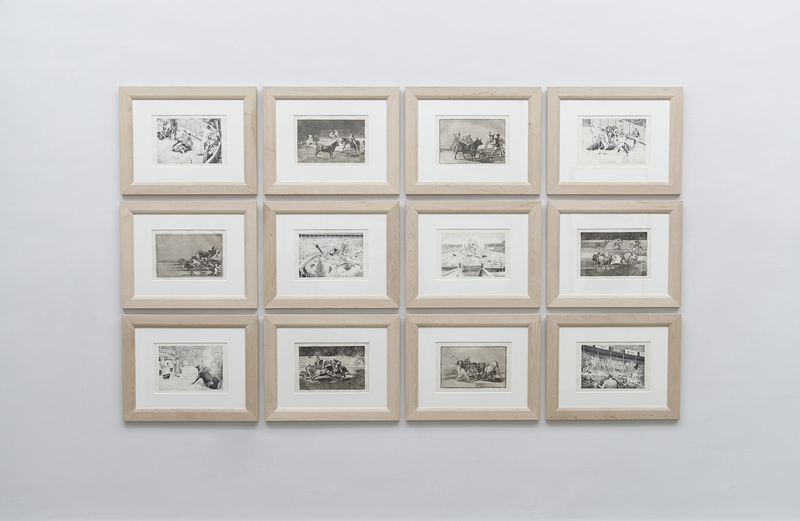 Six ink drawings and six original prints from the first edition of Goya’s Tauromaquia. 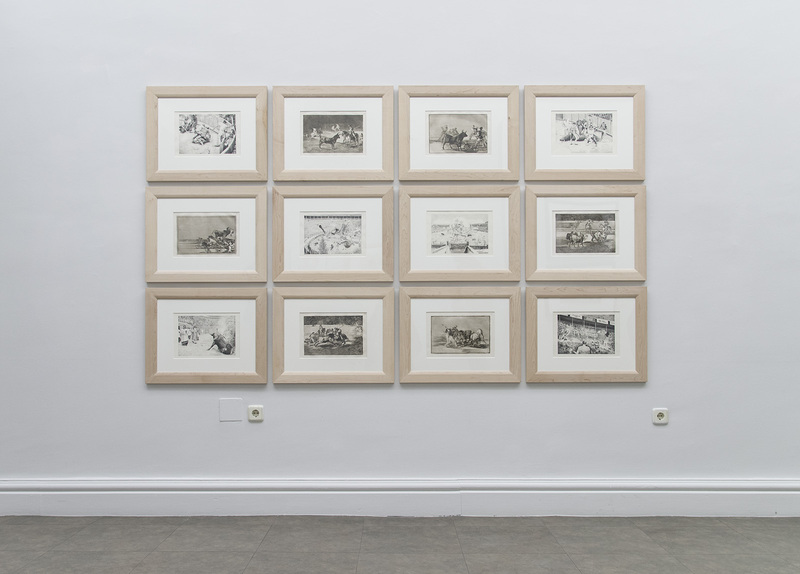 Goya left us no writings to explain his Bullfighting etchings, in contrast to Los Caprichos (The Whims) and Los Desastres de la Guerra (The Disasters of War). 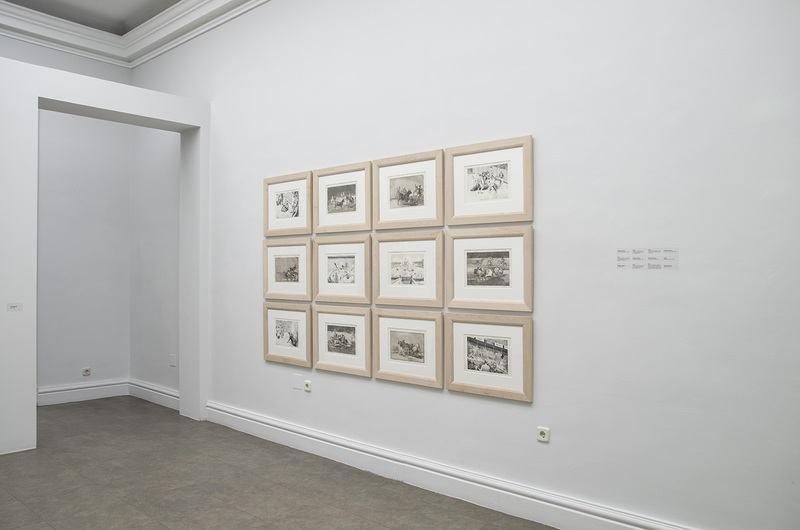 Understanding why he composed such grim and unusual images when his financial situation was very complicated – because of his family and a lack of work – is an enigma. He came to the bullfighting image market for pecuniary reasons, but above all because of his need to overcome the difficult years he had lived in war, by means of an apparently much more light-hearted subject. Maybe he did not think that in bullfighting he would encounter the seeds of brutality and human injustice that he denounced in other series. The debate about his attitude to bullfighting could be the subject of many more studies and articles. There is plenty of speculation about the matter, and despite the fact that for over a century the party line was that Goya was a lover of bullfighting, it was not until 1961 when a study by Englishman Nigel Glendinning proposed a critical Goya, much more identified with the anti-bullfighting sentiments of his time. It is no surprise that this idea should come from England, where the “harrying of bulls” was banned over a century before Goya’s time and where animal rights arose in the environment of utilitarian thought with the Principle of human treatment that Jeremy Bentham wrote in 1791. Could Goya have read Bentham’s treaty, in which it is argued that even though animals are not human they should be dealt with from a moral standpoint, and where he wrote: “It is not a matter of whether they can reason, or whether they can talk, but rather whether they can suffer”? . 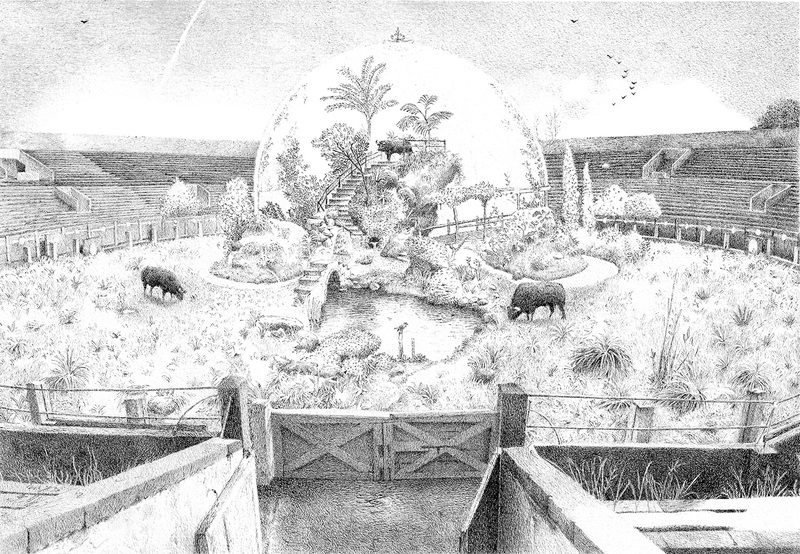 To be honest, I doubt it, and it would be very ingenuous to project consciousness in favour of animals back to the Spain of those times. 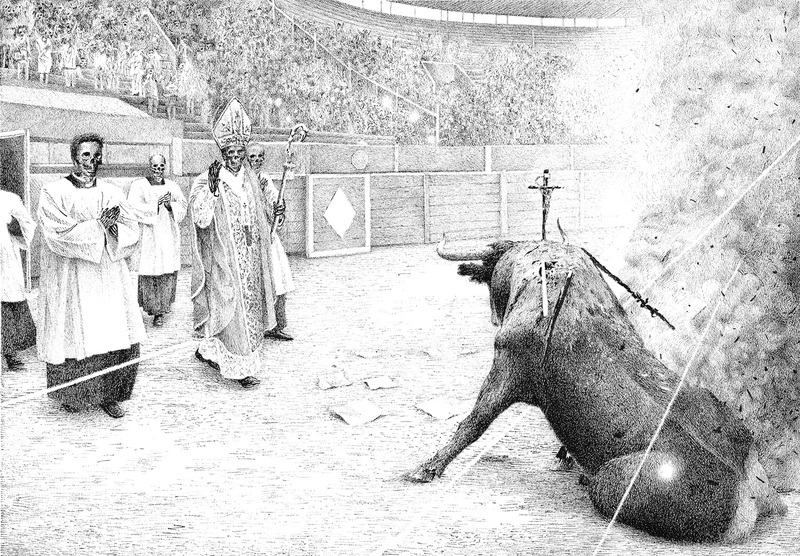 It is much more likely that his sources lay in Moratín’s Carta Histórica (Historical Letter) or Tixera’s Arte de torear (The art of bullfighting), as proposed by Lafuente Ferrari. Neither the artist nor anyone else in the pre-Enlightenment bourgeois environment was concerned about the “question of animals”, or the ethics of animal suffering. This is clear from Goya’s letters to his friend Zapater, explaining how he enjoyed going hunting and to the bullring, but this was Goya at the age of 35, before he went deaf and before his confrontation with the Inquisition over Los Caprichos, and before he had witnessed the atrocities of war. Concluding that Goya was a lover of bullfighting from a letter written to a friend, inviting him to the bullring in 1781, without taking into account his turning point, inspired by the French Revolution, towards more liberal ideas, or the disdaining of the political positions he had defended before the war, is as meagre an argument as saying that I am a football fan because my father took me to see some games when I was a child, ignoring the fact that now that I have become aware of the FIFA’s mobster activities and the use of football by governments as an instrument of social and political control, I despise it and criticize it whenever I have the chance. 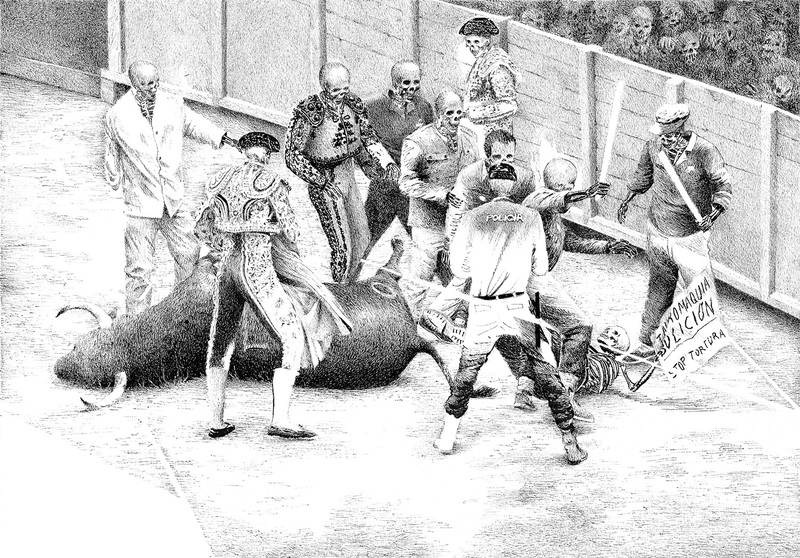 The artist’s relationship with Jovellanos and other anti-bullfighting and enlightened figures such as Vargas Ponce must have affected his opinion. 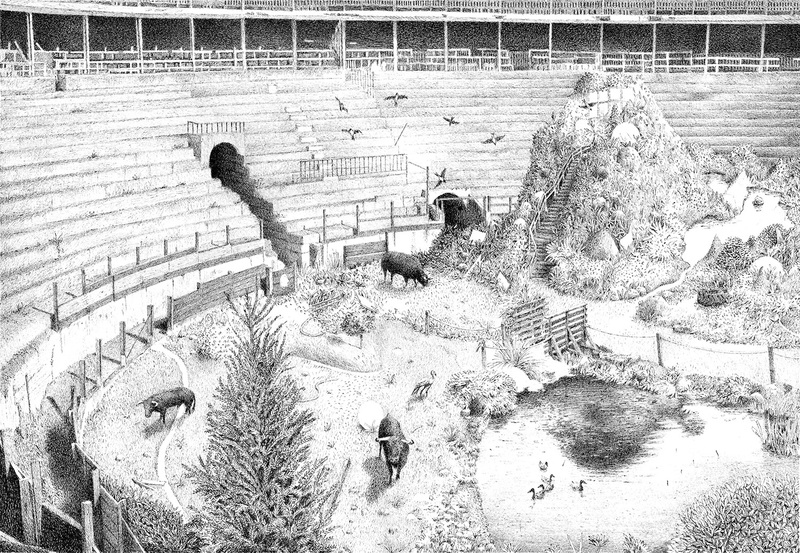 His lithographs Plaza partida (Divided bullring) and Diversión de España (The fun of Spain), belonging to his series Los toros de Burdeos (The bulls of Bordeaux) are clearly anti-bullfighting, which evidently questions the bullfighting world’s attempts to monopolize the Tauromaquia (Bullfighting) etchings; but if Goya was against bullfighting, his concern was limited to the human condition. 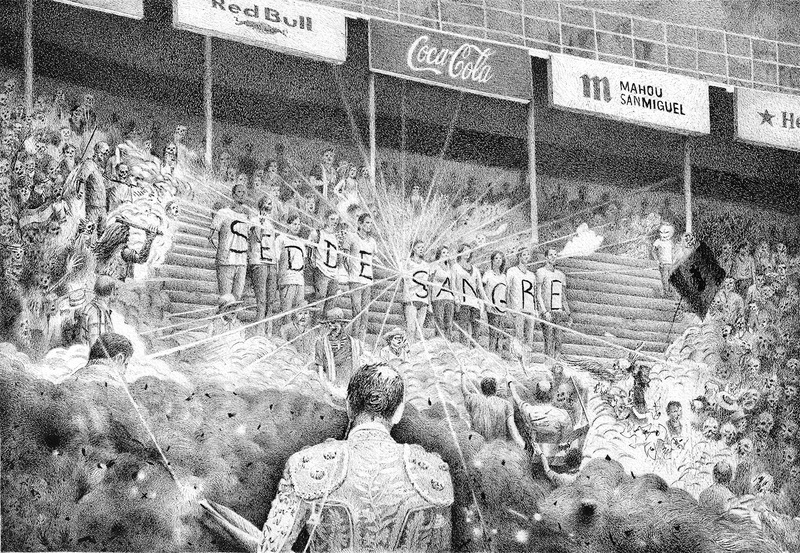 In my opinion, the last sentence in an article by Sánchez Ferlosio in 2012 could very well illustrate what Goya might have thought when he contemplated his own engravings: “My burning desire is that bullfighting will end once and for all, and this is not because of any pity I feel for the animals, but rather because of human shame”. And so, now that two hundred years have gone by from the publication of Goya’s Tauromaquia to the exhibition entitled Other bullfights, on the 200th anniversary of Goya’s Tauromaquia, which is currently open at the National Engraving Centre, we are once again astonished by his gaze. He seems to be asking us about our lot, if we are still torturing bulls and consequently ourselves. 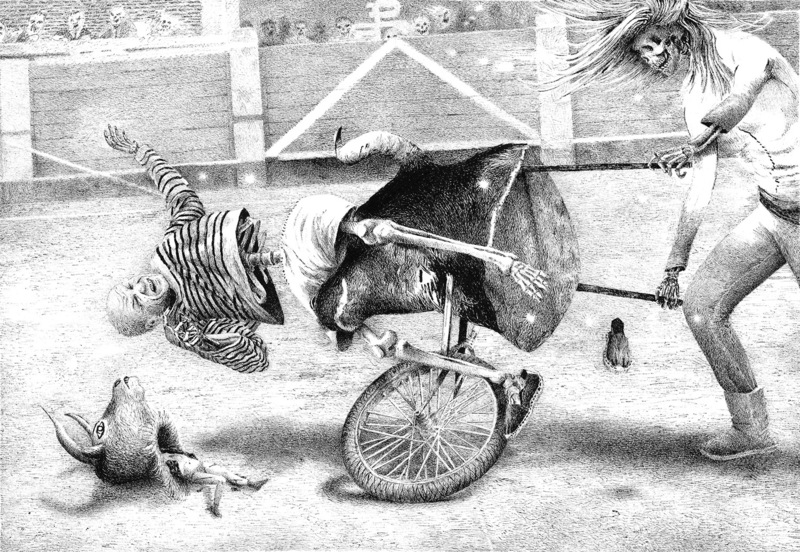 For the occasion I have worked on a series of drawings, which based on a dialogue with Goya, show my own personal impulse and the logical continuation of a social movement that sees in bullfighting an anachronic cruelty that cannot be defended by the morals of our age. When I approached the original engravings I felt as if Goya was asking me to come to him, to understand his images and explain to him that bulls are living beings with a soul, that they suffer, feel terror and abandonment when they are tortured, in a very similar way to us. Science has discovered that they reason, they have awareness and are nothing at all like the “complex machines” Descartes said they were. 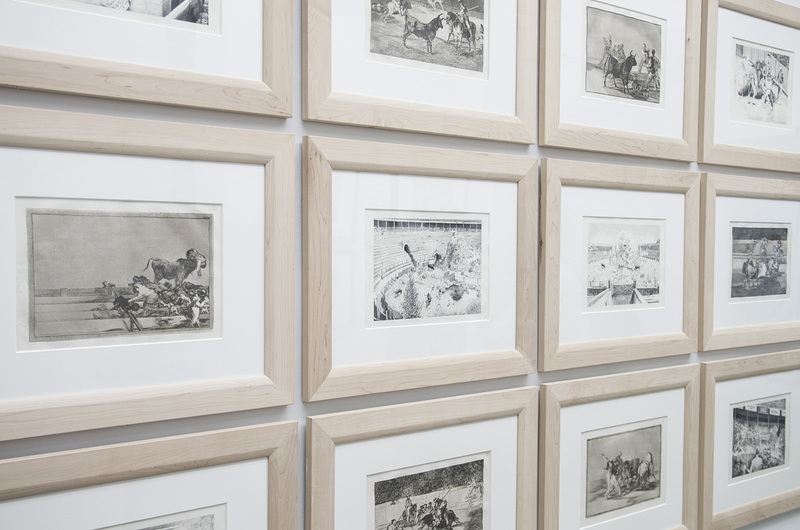 The violence in Goya’s etchings, violence against animals, is the foundation of all the injustice, lowness and infamy of the society he was criticizing, in addition to his monsters, the fruit of a lapse in reason. 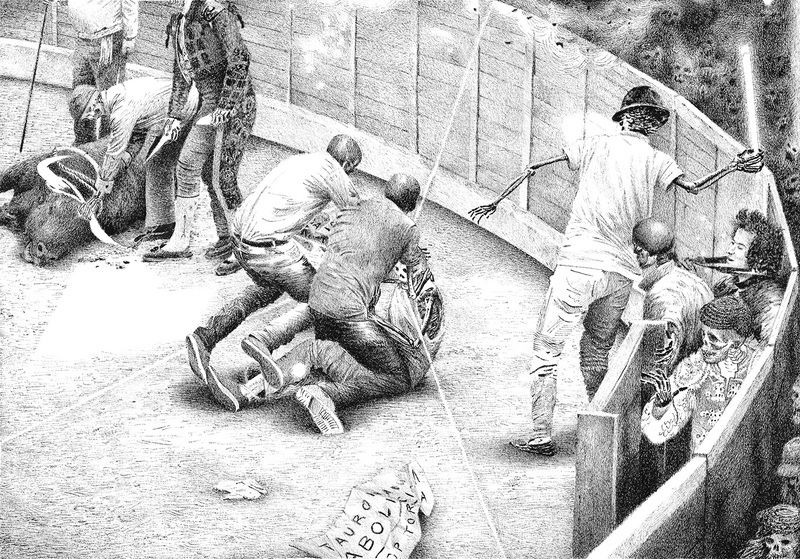 This is how I see bullfighting today in a very different society and world. Almost eighty percent of Spain is against continuing this custom; in just a few years we have experienced a late but urgent social change and a revolution in anti-bullfighting policies. In 2012 Catalonia abolished bullfighting and city councils and municipalities all over the country started to cancel public subsidies for it, while the United Nations warned that it breaches Children’s Rights; all this is proof that Animal Rights have come to stay in political agendas. Right now we have to work in the field of culture, and understand that bullfighting is part of culture, just as binding little girls’ feet to obtain the lotus flower is part of Chinese culture, and clitoral ablation is part of culture in a large area in Central Africa. And it will continue to be so, so that bullfighting can be exhibited in History and Anthropology Museums as a relic of our past, where it should have been consigned centuries ago; first of all art has to stand aside and then shake off this burden. We no longer have to be cautious like Goya was. As artists we have a debt and a responsibility if we want our society to teach the coming generations new ideas and mythologies that come from our best traits, to imagine a different paradigm that distances itself from traditions that insist on perpetrating the worst kind of crimes and barbarities.